How’s your Saturday going? I was supposed to go to an event at a local brewery today and it got rained out. I am very sad about this because now I might have to actually be productive. No. No. No. 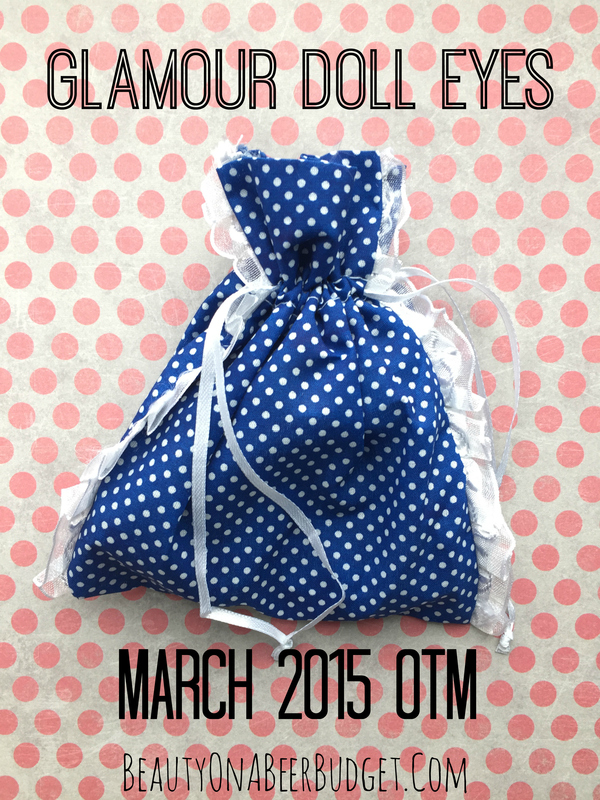 Anyway, in good news, I was lucky enough to grab an available one month OTM from Glamour Doll Eyes, and I am here to share it with you today! The Glamour Doll Eyes OTM is a $10 subscription that is sold in 1, 2, 3, 6, and 12 month sets (12 month is sold out though). To get a subscription you have to enter your name into a lottery system. At the moment there are only 20 slots open for April, so myself and others will be crossing our fingers to get picked! 1 month subscriptions and the Color of the Month are available for purchase on the 8th, but they sell out pretty fast! Since April will be on a work day, I’m kinda worried I won’t be able to get one, but I’ll do my best! My March subscription shipped on March 13th, and it was delivered on the 17th. Though I don’t have a special interest in this show, I’ve really enjoyed the design and packaging on the OTM’s this year, and this month’s was no exception. 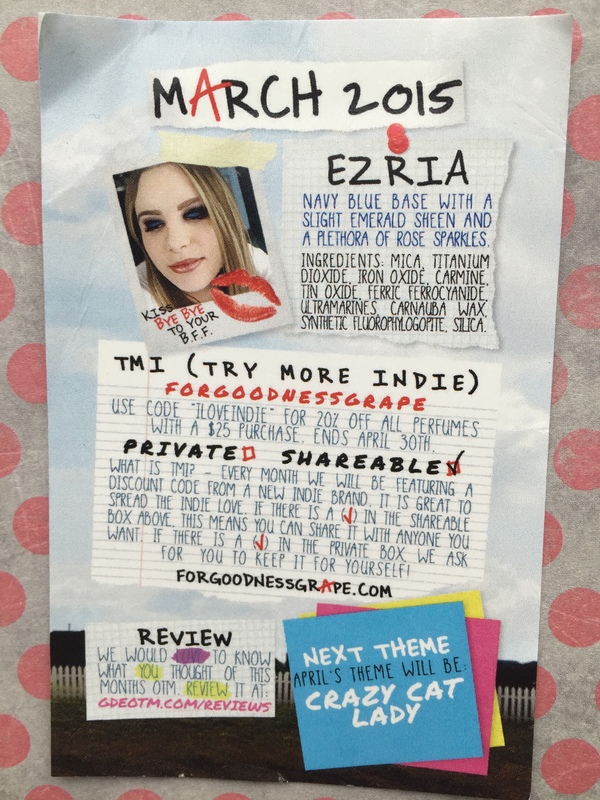 I also saw that one of my favorite indie bloggers was featured as the model this month! Hey Evolution of a Foodie! I feel like I need her autograph now. 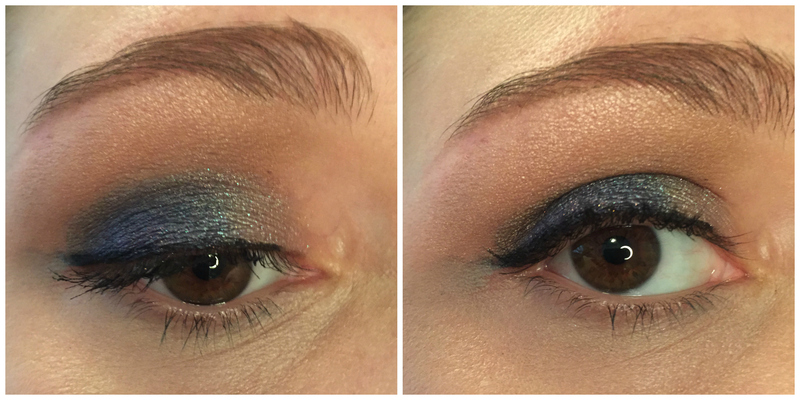 Left half of swatch over GDE Glitter Fix, the right half is over Too Faced Shadow Insurance. Super close up shot on bottom right. So due to a discussion I lurked on over at reddit’s Indiemakeupandmore, I’m going to try out swatching over two different primers for awhile. We’ll see if that drives me bananas or not. Anyway, this is a vibrant deep blue-purple with lots of pink sparkles. It’s a really pretty color, though I don’t know how much I’ll get to use it. 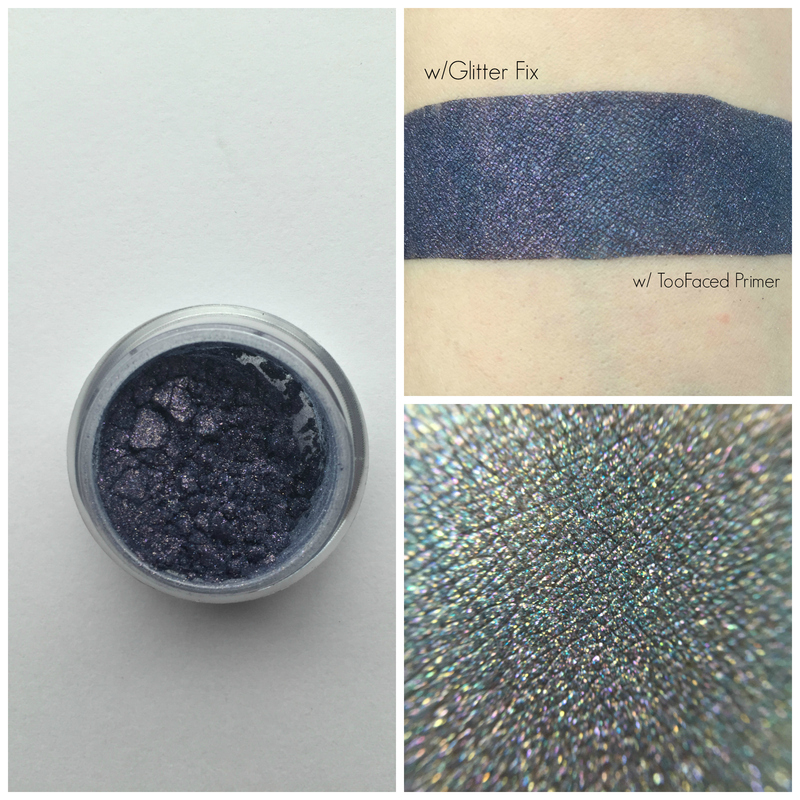 Over Glitter Fix, the glitter comes out a lot more, and over regular primer, the blue base appears a bit deeper. I put Be My Anchor over the first half of my eyelid, and Ezria over the second half, both layered on Glitter Fix. I blended in the middle to get a more gradual effect, and then threw Naked in the crease and Sin on the brow, from the UD Naked palette. Then I sloppily lined with e.l.f.’s Cream Eyeliner, because I was not having it with eyeliner today. I also would like to foil Ezria as an eyeliner, and use it all over the lid with a pink in the crease for a dramatic going out color. I’ve got plans, people. I tried the sheer lip glaze formula this month in my Aromaleigh Ephemera Box, so I was already familiar with it. 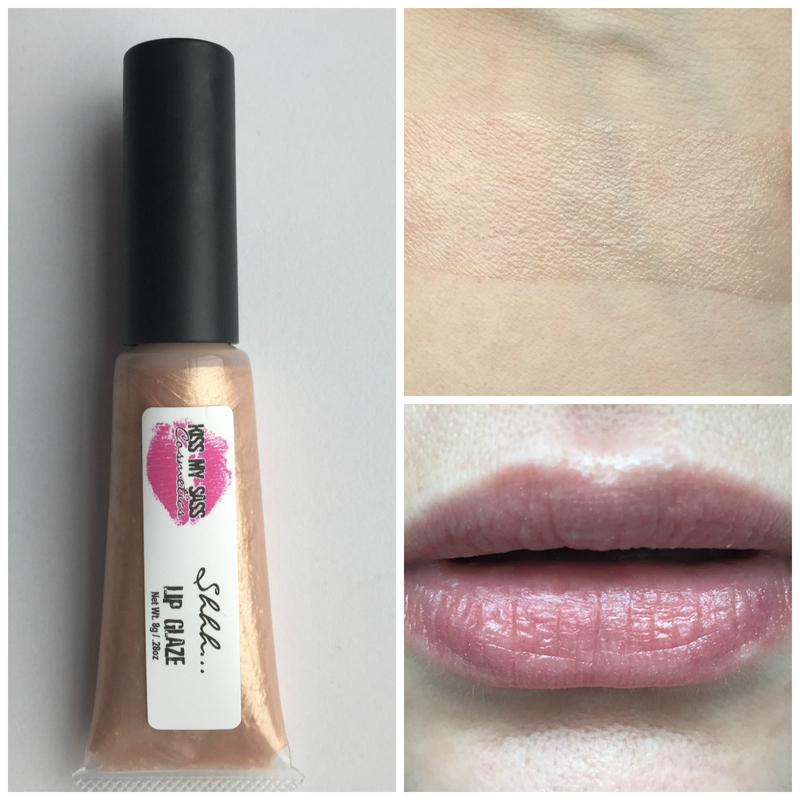 I don’t have much interest in sheer glossy products, but I do think this is a nice formula. It has a bit of a peppermint tingle, smells nice, and is not too sticky. I also like that I got a full size with a wand, which makes for easier application. I wouldn’t mind trying this in a darker color, but sheer is just not for me. Overall: I think Ezria is a really beautiful color, and I hope I can find more situations to wear it in. (Dark blue is just not a daily use color for me unfortunately.) It was definitely my favorite product in this box. While I liked the lip glaze and false eyelashes, I’m not really seeing myself being able to use them, and I’ll probably pass them on. 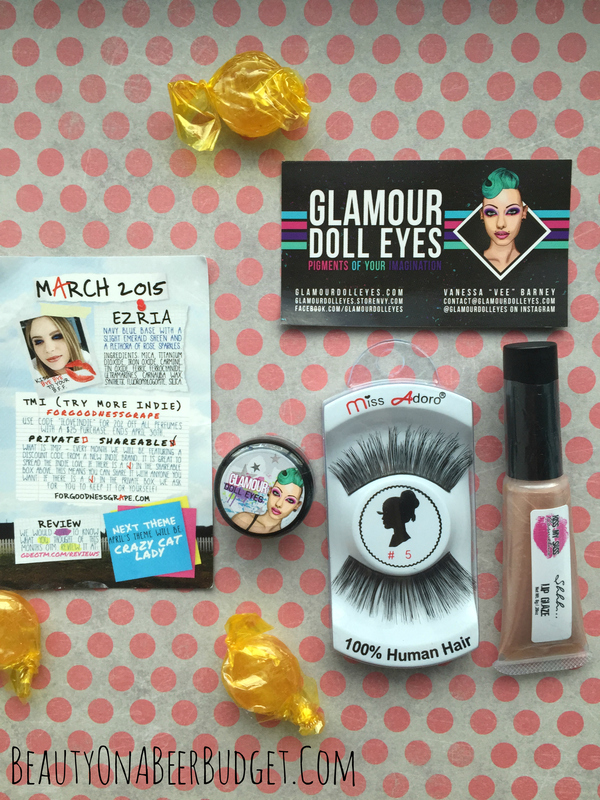 For more Glamour Doll Eyes’ OTM Reviews, check out my previous months! PS: Next month’s theme is “Crazy Cat Lady”, and I’m so hoping I can grab a box. There’s a lot of potential with that theme. -What did you think of this month’s OTM? 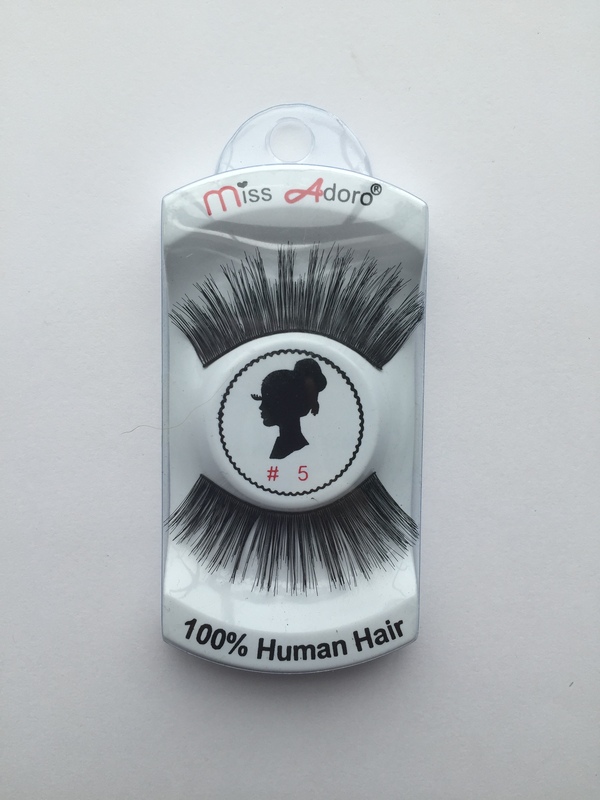 -How skilled are you in false eyelash use? -Did anyone see those butterscotch candies and think, “I found these butterscotch candies in my pocket! They just appeared!” (I may have binge watched Unbreakable Kimmy Schmidt). See you tomorrow for Subscription Sunday! I’m also disturbed by the human hair! I am glad to hear someone else say it too 🙂 But, I think that is normal of classy faux lashes.